Mor Mikhayel Rabo (St. Michael the Great) was born, in 1126 AD, in Melitine (Malatya, Turkey) which was one of the famous Archdioceses of the Syrian Orthodox Church of Antioch at that time. His birth took place during the reign of Patriarch Mor Athanasius VII Abu Al-Faraj, son of Kamoor (1091-1129 AD). Patriarch Athanasius was said to be perfect in all virtues and a great scholar. Because of his passion for knowledge and virtue, the Patriarch ordained the great scholar Malphono Sayd Ibn Al-Sabouni as Metropolitan of Melitine, who, in less than forty days after his ordination, was martyred at the hands of Gabriel, the unjust and brutal Byzantine ruler of Melitine. The latter accused him of some political matter of which the Metropolitan was as innocent as the wolf was of the blood of the son of Jacob. Further, Patriarch Athanasius himself suffered severe hardships in administering the Church internally as well as externally. During his youth, Michael was raised in a Syrian home from which the sweet fragrance of Christ emanated. His father, Elia of Melitine, was a virtuous and pious priest and a descendent of the Qandasi family which produced many servants for the Church. Among them were Athanasius Zakka, Metropolitan of Ayn Zarba (+1166); Patriarch Michael the Great's uncle, Maphryono (Catholicos) Gregorios Yacoub; and Patriarch Michael II Junior, the nephew of Mor Michael the Great, also known as Yeshou Sephtono. Young Michael became a monk at Mor Barsawmo's Monastery near Melitine, after which he was ordained a priest and appointed Abbot of the monastery. During his term as Abbot, he made arrangements to bring running water to the monastery. When the Patriarchal See became vacant following the death of Patriarch Athanasius VIII, the Holy Synod of the Syrian Orthodox Church of Antioch, consisting of eighteen Metropolitans, convened in the Monastery of Fesqeen near Gargar on Pentecost Day. With the guidance of the Holy Spirit, the Synod elected unanimously Raban Michael to the Patriarchate of the Apostolic See of Antioch. When Raban Michael learned of this, he ran away and disappeared as he thought he was unworthy of this most exalted position. However, Mor Dionysius Ya`qub Bar Salibi, Metropolitan of Amid (+1171) and one of the Holy Synod's members persuaded him to perform his duty. On Tuesday, October 18, 1166, Michael was consecrated Patriarch at Mor Barsawmo's Monastery with the laying on of the hands of the Maphryono along with twelve other bishops. The new Patriarch passed thirty-one laws in the Monastery of Hananya. Among the most glorious pastoral works of Patriarch Mor Michael the Great was the moving of the headquarters of the Patriarchal See of Antioch from Amid to Mor Hananya Monastery, known as "Zafaran". On the day of his arrival at this Monastery and the celebration of his enthronement on the Patriarchal Seat in the new headquarters, Metropolitan Mor Dionysius Ya`qub Bar Salibi delivered a fascinating speech that began with "My beloved, today is the day of joy; today is the day of delight". In his invaluable speech he enumerated the praiseworthy virtues of Patriarch Michael. Patriarch Michael paid Apostolic visits to his Archdioceses that were widespread at that period of time. In 1168, he headed for Jerusalem and stayed at the Monastery of Mary Magdalene near Damascus Gate (Bab al-caamuud). There he consecrated the Holy Murun (Chrism) and ordained John (Yohanna) as Metropolitan for Damascus on Easter day. He then returned to the headquarters of his Apostolic See at the Monastery of Hananya. There he passed a number of ecclesiastical canons, as reported by the great scholar Maphryono Mor Gregorios Bar Ebroyo. He also held a Synod meeting in 1169 at Mor Barsawmo's Monastery. In the following year, Emperor Manuel dispatched a messenger named Theoryanos to the Syrians and Armenians. Patriarch Mor Michael answered him through John, bishop of Khayshum, and the monk Theodoros Bar Wahbun. In 1180 AD, Mor Michael held another Synod meeting where Theodoros Bar Wahbun of Melitine was excommunicated. Although Bar Wahbun was a great scholar, he was arrogant and devoid of godliness and fear of God. Bar Wahbun rebelled against his superior and was later ordained as anti-Patriarch by four castaway bishops. Although he was a disciple of Patriarch Michael the Great and was educated in the Patriarchal house, Bar Wahbun denied the favor of Michael, and in the end, was excommunicated and dislodged. Bar Wahbun died in 1193. Mor Michael wrote a book on the ranks of priesthood, liturgical texts on preparing for receiving the Holy Qurbono (Eucharist), the duties of man, how to be a disciple of Jesus, and the need for repentance and confession. 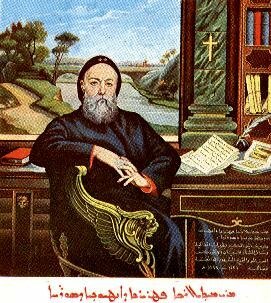 Following his consecration and according to the ancient custom followed by the Syrian and Coptic Churches, Patriarch Michael sent a letter of fellowship to the Patriarch of Alexandria, Pope Yohanna I Ibn Abi Ghalib, known as Aba Al-Majd, in which he included his confession of faith. He also authored another letter to Yuhanna's successor, the Alexandrine Pope Mark III Ibn Zar'ah, on the Sacrament of Confession. This is the Sacrament that was rejected by the heretic Mark Ibn Qanbar the blind who created confusion in the minds of the children of the sister Coptic Church for a long time by his false teaching. In doing so, Ibn Qanbar had renewed the heresy of the followers of Origen and the Messalians. Patriarch Mor Michael the Great refuted the weak reasoning of Ibn Qanbar as well as his false teachings, proving the necessity of practicing the Holy Sacrament of Confession. He also supported the excommunication of Ibn Qanbar and his abhorrent heresy. Patriarch Michael ordained one Maphryono and fifty-four bishops. He departed to the Heavenly Chambers on Monday, the seventh day of Second Tishrin (November) in the year 1199, at the age of seventy-three, thirty-three of which he was Patriarch. He was buried in the new church at Mor Barsawmo's Monastery in the tomb that he had prepared for himself. Indeed, the life of the commemorated Patriarch Mor Michael the Great, was one of righteousness and holiness. He led the life of the good confessors who were persecuted for the sake of righteousness following the example of most of the Patriarchs and many bishops of our Holy Church. Likewise, he was an honorable scholar and renowned researcher. Patriarch Ephrem Barsoum describes him as "one of the greatest pontiffs of the Church of God, the finest of the Patriarchs of Antioch, a scholar, and a famous chronicler; of everlasting name, of graceful pursuit, and of uncommon qualities, of widely known virtues, and of good deeds". Patriarch Barsoum converses with him saying, "Is it not right for the general history of the world to remember your honorable name since you have written those volumes that are full of the events of the ages, from their inception until your happy reign, for you have brought to life what took place, and had it not been for you, these would have been totally forgotten? Indeed, it is befitting to do so for the world in general and for your nation in particular. Your greatness is manifest not only in this, but also in the fact that you were magnificent in your virtues, endurance and self-esteem. You were great in your Patriarchal works. It is no wonder that history describes you as The Great". The late Patriarch left behind several of his books, the most famous of those is "THE RELIGIOUS AND GENERAL CIVIL HISTORY FROM THE CREATION UP TO THE YEAR 1193". This was wrote in Syriac and comes in several volumes. A unique manuscript of this great work is kept to this day in a book-case at St. George's Church in the Syrian Quarter (hay al-suryaan) of Aleppo. Another famous writing of the late Patriarch was the book on the ranks of priesthood, liturgical texts on preparing for receiving the Holy Qurbono (Eucharist), the duties of man, how to be a disciple of Jesus, and the need for repentance and confession. He spent his day in looking after Church matters and in transcribing significant manuscripts; he devoted the night to the writings of letters. He transcribed Gospel on vellum in the Estrangelo script, gilded its pages and bound it with a silver cover. (It was the Syriac bible written during the time of Mor Michael Rabo and which was kept in Malankara, that was presented to Dr. Buchanan during his visit to the Church in Malabar in 1807. This one is now preserved in the British library). Patriarch Mor Michael Rabo has compiled all the hymns of St. Ephraim and Jacob of Sarug in several copies, which he transcribed personally. Also he marked the service books of ordinations, principal festivals and prayers with diacritical points with great care and preserved them in one huge volume. Several other books are there written by this great Patriarch.